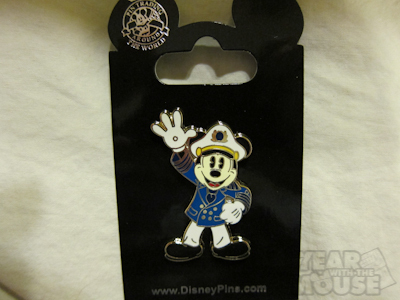 Disney Wonder Pacific Cruise Part 4 PIN GIVEAWAY!! 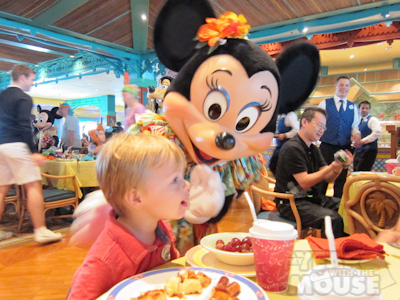 Don’t miss Part 1, Part 2, and Part 3 for my full trip report on the Disney Wonder Pacific Cruise, September 20-25th. Notice I’m shortening the title? It’s getting a little unruly. 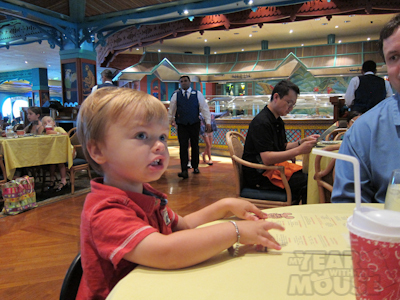 But here we are on Part 4 of the cruise trip report and now, MYWTMouse fans, it’s time for a PIN GIVEAWAY!!! But first, some chatting about our character breakfast. Our character breakfast was really a lot of fun, and because we were the second seating for dinner we didn’t have to get up insanely early to go to it either. Theo’s gotten really into characters lately, particularly Goofy, so it is always fun to meet the characters. I love character meals too. 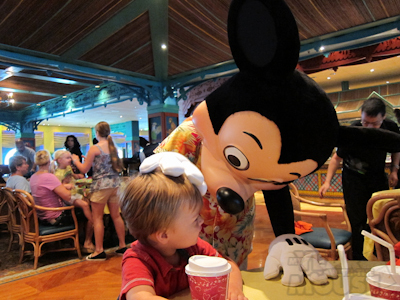 We had our first one at the Mouse-in-Law (Disneyworld for you newbies) and it was awesome. 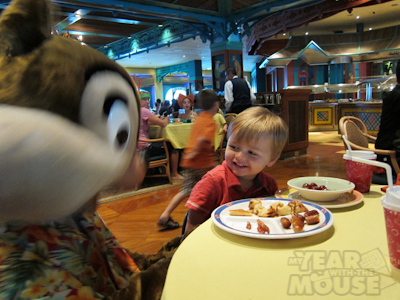 Such a great way to meet the characters in a low-key format, and you get to eat instead of just waiting in line! The characters had their pre-set route, and it seemed like we were the last table on the whole circuit so that was a little tough for Mr. Impatient (Theo, not Kevin). But one of my favorite moments was when Pluto came up behind Theo and Theo was completely unaware that he was there. Kevin had to tap him on the shoulder a few times to get his attention. Chip swung by, like literally swung. 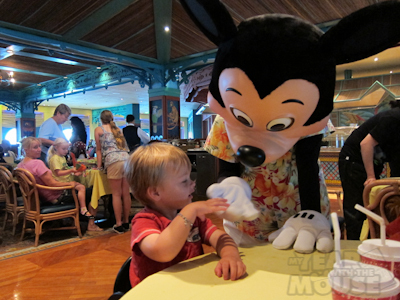 Theo has become a real Mickey and Minnie fan too. Telling Minnie a story. Minnie is remaining strangely silent. Mickey is definitely one of my favorites. 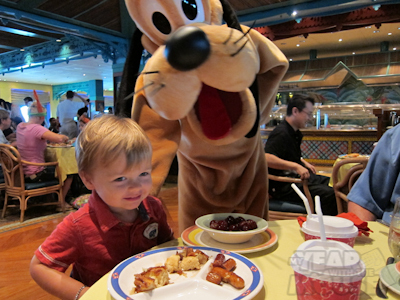 We actually didn’t get to see Goofy given our location on the circuit and Theo’s attention level at the end of breakfast. 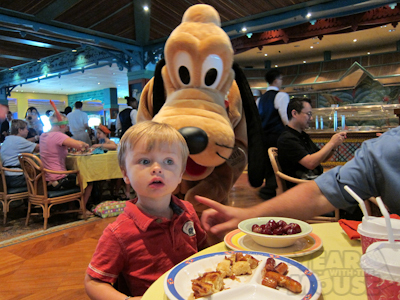 We made up for it by seeing Goofy later though! I loved this little guy and can’t wait to send him to one of you! 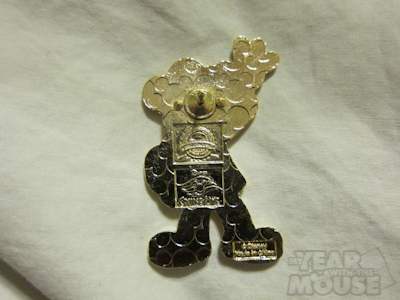 Now I’m not a pin trader–I have some pins I like so I don’t want to trade them–but I think this one will make a nice addition to anyone’s collection. Refer a friend on Facebook! They must leave a comment with your name! This giveaway ends 11:59pm Pacific time on Friday, September 30th. That’s two days, so get crackin’, and good luck! I want a Mickey pin! I totally want a Mickey Pin!!! I want a Mickey pin! Sprite just started trading pins on our last visit to Disney World and at first she was hesitant to give away anything, and then once she realized what she could do, she started going up to every cast member with a pin set and demanding their time so she could peruse the merchandise. 🙂 I think I’m going to buy another pin lanyard and attach the special ones to that so she doesn’t trade those. Another lanyard is a fabulous idea! Next time keep an eye out for cast members with a green or teal lanyard–those are for kids to trade only. I think that’s a great idea! ¡!¡!I WANT A MICKEY PIN¡!¡! I would love the MIckey pin, which is totally adorable….so nice to see Theo’s smile in the photos! I would love a mickey pin every so much! I want a Mickey pin!!!!!!!!!!!!!!!!!!!!!!!!!!!!!!!!!!!!!!!!! Your son is absolutely adorable. I have a 2 year old daughter and it is a chore to get her to smile when looking at the camera. It is also difficult to get a picture that doesn’t have her hand reaching for the camera while she is saying “I want to see”! Thank you! Yes, the hand toward the camera is a problem of ours too. Our later pictures have a smudge in the upper left hand corner thanks to a fingerprint. It is hard to get him to smile so we try to sneak up on him to get the picture. Toddlers are a challenge. Love your blog and I want a Mickey pin! !!!!!!!!!!!!!!!!!!!!!!!!!!!!!!!!!!!!!!!!!! !I want a Mickey Pin !!!!!!!!!!!!!!!!!!!!!!!!!!!!!!!!!!!!!!! but I don’t know how to Tweet……. So I will just have to say TweeeeeeeeeeeeeeeeeeeeeeeeT!!!!!!!!!!!!!!!!!!!!!! Oh and My hubby who doesn’t use facebook very often actually follows your Year with the Mouse!!!!!!!!!!!!!!!!!!!!!!!!!!!!!!!!!! I WANT A MICKEY PIN!!!!!!!!!!!!!!!!!!!!11!one! For serious, I love pins. ❤ My fiance and I just recently started collecting..though our collection is mostly stuff we've found sentimental and cutesie. I want a pin!!!!! That is such a cute one too!! I also would like to know if you saw many grown-up only parties on your cruise. 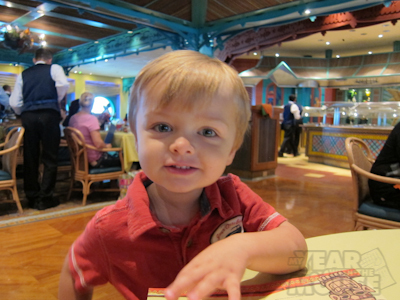 I seriously want to go on a Disney cruise!!!!!! I spotted a number of adults-only parties, particularly at our 8:15 dinner seating. Go for it! I, too, would like a Mickey pin. Nay, LOVE. Great trip report. I want a pin! I want a pin!!! Love pin trading! Anyway, I want a pin!!!!! I liked you on Facebook a loooooong time ago. I want a Mickey pin! So I can put it on my purse strap for our upcoming, first-ever Disney cruise! (so your Wonder review is much appreciated!) Whew! I just made teh giveaway cut-off time! RE “Theo is going as Tuxedo Mickey which is pretty much going to skyrocket the Cute Chart all the way to the top.” For sure! With your luck, you’ll probably win this one. Not to say that it’s not cute – because it is adorable and if I were a pin trader I would LOVE it. But I can see that pin either in Audrey’s mouth or the bottom of our toy box abyss. Neither would be a good outcome for that very handsome Mickey. I want a Mickey pin!!!!!! Also I already follow you on facebook!!!! I like your posts there alot!!!! I know how to follow instructions!!!! I love how giveaways bring out the commenters! Like Kristin, I don’t want to win the pin, and not because it’s not cute. Not because I’m concerned that it’ll end up in my kids’ mouths, either…although they’re teenagers, which is a lot like a second toddlerhood. They don’t want to go to bed when I want them to, they sometimes need a reminder to bathe, and “no” seems like one of their favorite words. 🙂 I’m not a pin collector, other than the random pins I’ve gotten over the years and that I hang onto for inexplicable reasons, like the possibility of “pin day” at school or something. And because I have a wee bit of a pathological inability to get rid of things that I *may* need someday, but I’m working on that. That pin deserves to go to somebody who will give it the love and cherishment (????) it deserves. (Yes, I did just make up a word there.) I’m not a pin trader because I would find it impossible to trade any pin that I didn’t have a duplicate of. Also, because I don’t go a lot of places where pin trading is a thing. But good luck to all of those who want the pin! 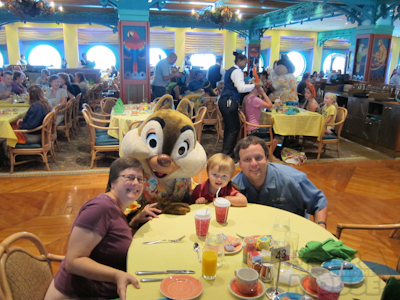 Oh, and thanks for helping me *finally* learn which one is Chip, and which one is Dale! Until I forget again, that is. I want a Mickey pin!!!!!!!!!!!!!!!!!!!!!!!!!!!!!!!!!!!!!!!!!!!!!!!!!!!!!!!!!!!!!!!!!!!!!!!!!!!!!!!!!! Oops sorry just read that it ended! Awe, that’s okay. I threw you in anyway ;).